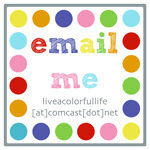 Live a Colorful Life: Gingham Giveaway Day! Today is the day for the Gingham Giveaway! You still have a chance to win some gingham fat quarters and a half-yard of Kona white. Thanks to Elizabeth and Krista,who came up with this great idea, you actually have three chances to win. 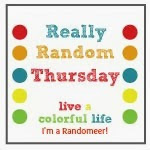 Leave a comment here--tell me about 4th of July memories, or July 1st if you are Canadian, or Australia Day, or any other summery celebration. Then head over to say hi to Elizabeth and Krista. Remember--the winner needs to commit to making a block, a few blocks, or even a whole quilt, and then post a picture on July 4th. Isn't gingham just so cheery and summery? Come on. You know you want to join the gingham gang. 4th of July in Wilton, CT meant a hike through the woods to the place where the town fireworks were held. On the way back to the car, the woods were dark except for the hundreds of flashlights from everyone walking back. The fireworks were great too, and the whole town was there. I grew up in a small town - Downs, IL - and families would gather in the town park for a parade and fireworks. People drove in from their farms or "subdivisions" in the area. I always looked forward to the day! waking up at 12:01 a.m. on July 4, 1976 to the sound of a saxophone playing the Star Spangled Banner. I'm a CAnadian and I spent a week at International Music CAmp at the International Peace Gardens on the Manitoba/North Dakota border. thanks for the chance to win. Best 4th: 19 years ago watching the parade from the roof of the Museum of Science in Boston, with my then 4-year-old, his dad and my mom... The fireworks reflected on the Charles River. Magical! Well I'm from the UK so we dont celebrate July 4th, my birthday is July 2nd however, so I shall pretend that I have all these years been secretly celebrating July 4th instead! We always headed down to the lake to watch the boat parade and fireworks on the fourth of July. I would love to play along! I have great 4th of July memories because our Family Reunion is always on 4th of July weekend! Cousins, water games, barbecue - love it! Of course I want to join! My favorite 4th of July memory (and I have many b/c it's a favorite holiday) is most definitely the Blessing Ceremony hubs and I had in Washington, DC. We married in a civil ceremony in our living room while he was on leave from deployment in 2004, in Jan. He returned from 1.6 years gone in May. In July of 2004, we had all family and friends come to DC, had our marraiged blessed by a minister and said family vows (we both brought kids to the marriage). Then we capped the night off by watching the DC fireworks from a balcony at the hotel. It was such a great evening and so wonderful to celebrate the end of the deployment and beginning of our family being together. thanks for the chance and letting me relive it! I would love to make something for the 4th. 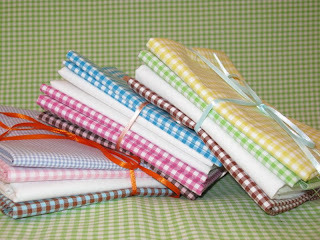 And I love Gingham have already made one quilt (guyish) and some hot pads out of it. Having a family reunion on the deck in B. C. for July 1. My brother and wife do an awesome job of hosting everyone. Australia Day memory for me is having friends for brunch after an amazing 60 km cycle by the bay! Love the gingham! Since I am Canadian - we celebrate Canada Day on July 1st!! I would love to go to Ottawa, the capital of Canada but since I work in a High School, this is not possible. Our town has fun events to celebrate and we head down to the beach to join in the festivities!! 4th of July for me is always a family cookout followed by fireworks. 4th of July with the kids watching fireworks over the Bayou eating watermelon. I love gingham, it is so versatile. Other fabrics from "back in the day" that I still love is "dotted Swiss" and "voile" Thanks for a chance to win. The 4th every year means a family get-together, watermelon, fried chicken, potato salad, lots of babies & kids, horseshoes, football, frisbe, fireworks, and sunburn! Love it all! Well, I have no 4th of July memory as good as yours, but I d remember one we were visiting family in Minnesota and the Northern Lights were so vibrant and strong that they delayed the fireworks for at least an hour so we could all enjoy Mother Nature's show! I've been hankering to make a gingham quilt!! Growing up, I spent my summers on an island in cape cod where we always spent the July 4th holiday with a beach barbecue with family and friends, followed by s'mores and fireworks. Great memories! Thanks for the great giveaway chance and the great reminder of fabulous memories! My husband and I had been married a couple of years. We were trying to get pregnant. On the 4th, we went with my family to see the fireworks. We were playing frisbee and for some reason, I thought it was a good idea to jump onto my husband. He was still in game mode so he ran...with me on his front...and then fell, while running full force with me on his front. I ended up in the ER not able to do any tests because I could have been pregnant. I threw out my back. And that is why the 4th of July, we make sure there are no frisbees anywhere around.